I bet not many people go that far for a marathon. 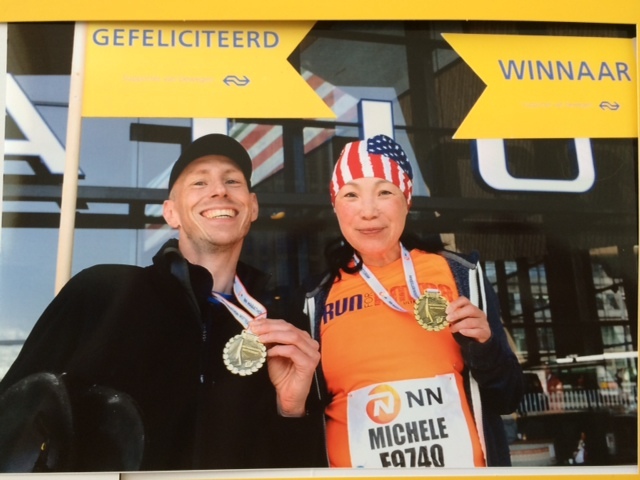 There are couple spring destination races to choose from, much bigger one or better known one like Paris Marathon, but I have chosen to fly 1,350 miles plus train ride to come to Rotterdam. And I definitely was showing my marathon spirit in a bright orange shirt (Queen’s color) and US Flag Buff. 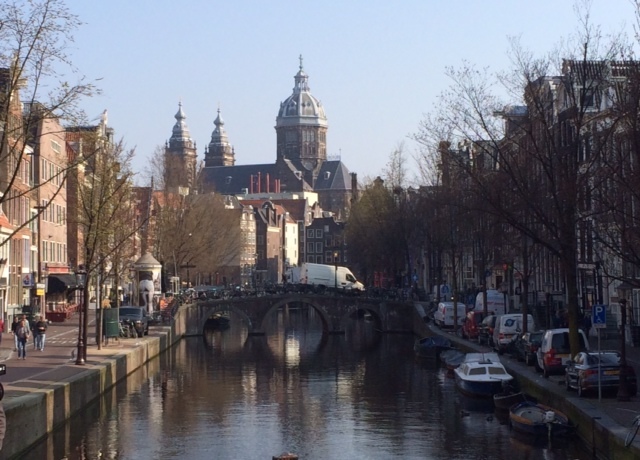 So why Rotterdam? many have asked. Answer is quite simple and I told everyone that — I am running it because my friend is running it. 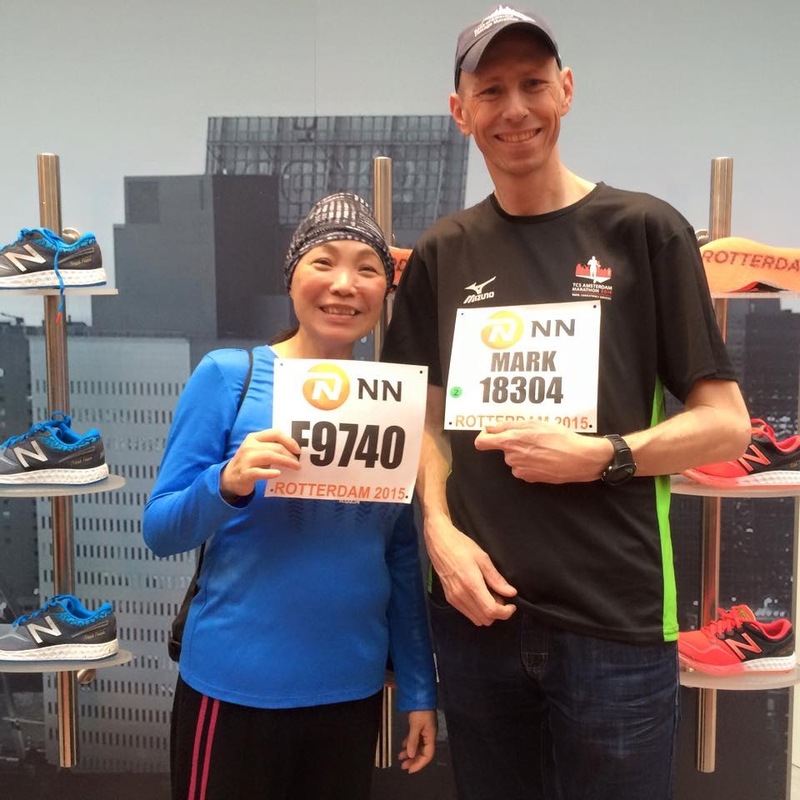 I have “met” Mark and Karl on Facebook three years ago when we found out we all got into Tokyo Marathon; we were posting questions on FB in English and soon we started sharing our training progress and travel plans with each other. 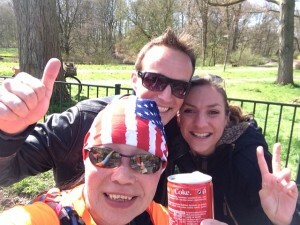 We live in different countries, Mark in Netherlands and Karl in France, but we all share the same passion of running around (no pun intended) and appreciate different cultures and love to travel. 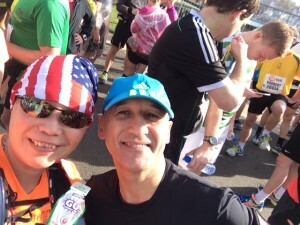 We ran Tokyo Marathon 2012 together, and in 2013 we got together and ran Paris Marathon. We have talked about they coming to US for Big Sur Marathon, but with the nano-sec sold out speed it’s hard to get all three of us into that one. Mark came to run Chicago Marathon in Oct 2013, and originally I was planning to hold sign and cheer for him in Chicago. But unfortunately it didn’t happen, I was in hospital when Mark ran Chicago. I continued to follow their running progress and saw how Mark becoming a super fast Luna sandal runner and Karl setting PR after PR and broke the sub-3 at Okinawa and earned himself the golden ticket to Boston. I wanted to have the opportunity to run with them again, and say “thank you” in person for their moral support and friendship during my very scary and tough journey. Early in Jan, I decided to sign up Rotterdam Marathon and visit Mark in Netherlands. I didn’t think training for this race would be hard after North Face 50, and I didn’t think it would impact my running when I started my treatment at Stanford. I almost laughed out loud when doctor told me that I would have hard time walking up stairs, what a joke!! But sadly it turned out that I became weaker and weaker and my fastest run was going to restroom to throw up. In early March, I started worrying about not able to make the 5:30 cut-off time — Rotterdam Marathon has the fastest cut-off time I ever known. But giving up has never been an option, and I am determined to run this marathon with Mark. Sat April 4th, I flew into Paris first not because I got a better deal on airfare, but because I wanted to visit Karl and wish him Good Luck at Boston in two weeks. 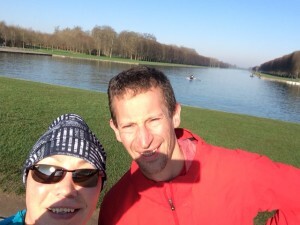 Karl took me to Versailles to do my shake-out run, and the snail paced me had a great time running with sub-3 Karl in the beautiful forest with fresh air, then we walked around the magnificent Palace after our 5ml run. What a beautiful day to spend time with dear friend! Wed April 8th, I took Thalys from Paris to Amsterdam, and the ride was smooth and comfortable. From one city center to another city center via railroad definitely is the best way to travel in Europe. I tracked the train speed with my RunKeeper and it’s so cool to see that crazy pace 🙂 After wondering around the beautiful & classic Amsterdam, I took the NS InterCity to Utrecht where Mark lives. It’s such a small & charming town that I fell in love with the slow and laid-back lifestyle immediately. We walked around the town, having coffee at below sea level cafe, went to forest to have Dutch pancake.. everything were storybook cute!! Sat April 11th, we went to Rotterdam for the race Expo. Mark told me that it would be nothing like Chicago or New York, and it indeed was a very small expo. No celebrity athletes signing & photo ops at mega booth, not many freebies to grab, nor tons of race shirts & hats to purchase…etc. And there are things we take it for granted here that’s “hot” to European runners, for instance the Salted Caramel GU gel 🙂 But it’s very interesting to see other races promoting their events here — Brussels, Munich, Barcelona, Two Oceans.. these are the events we don’t hear about here and my “list” was growing by the minute!! We had both signed up a mini 4.2K run so I could explore the old bridge that’s not part of the marathon course. It’s very windy and the rain was pouring down like crazy when the run started, and Mark asked me if that’s how CIM like that year :-p That evening we decided to have pizza at home as our carbo-load dinner, and Mark started pinning bib to his shirt on the dining table while pizzas were in the oven. The pre-race excitement is so familiar and universal!!! As my pre-race ritual, we watched a Dutch movie “De Marathon” which happened to be a film about Rotterdam Marathon with hard and blue collar humor. A marathon movie that I can relate to in a very personal way! At 9:15am, we walked over to the drop-bag area, then did the same porta potty routine like we do at U.S. races, or Tokyo, Paris..etc. 9:45am, we walked into our assigned corrals and we wished each other good luck, then Mark looked into my eyes and said it with very serious tone “the most important is to finish and be safe.” He probably was concerned about the very aggressive goal I had for myself. In my corral, people looked at me with interest, and some asked to have pictures taken with me when they found I am an American from San Francisco. Several runners told me they wish to run New York, two women told me their dream is to run Big Sur… these are the most friendly and most sociable runners I have ever met at international races I have been to. I wanted to truly experience Rotterdam Marathon, so today I would be running without music and GPS.. just enjoy the pure joy of running! The gun went off around 10:10. 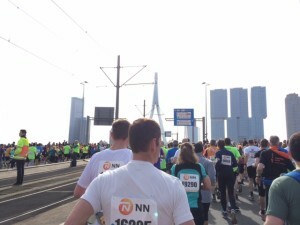 I have not studied the course map but did watch a course preview in a time-lapsed video, and what I remembered the best of course is the “Swan Bridge” — Erasmusbrug (and I still can’t pronounce any city or street name in Dutch), and I was told that we would run across that bridge twice. The race is in metric system, not our “freedom system” as Mark always joked about. I carried 5 GU gels with me, and thinking I would do one before the start, then one at every 10KM mark. GU early, GU often, that’s my strategy. The aid-stations would have water and AA drink — their electrolyte which I tried it at the Expo but don’t plan to rely on anything new. I carried 25 oz of GU Brew in my Salomon hydration pack, which should be enough given it won’t be too hot today. There were lots of spectators, volunteers and music bands – not your typical Rock & Roll bands we see in U.S and they played marching music. I wasn’t running with a watch or GPS, so didn’t know my pace but the first 10K went by fast. Race strategy for today was running comfortably, not pushing and not holding back. 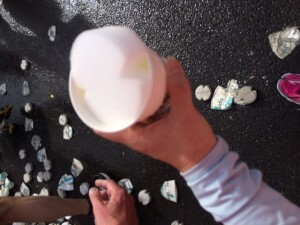 I grabbed a cup of water from the volunteer and took my first GU gel. 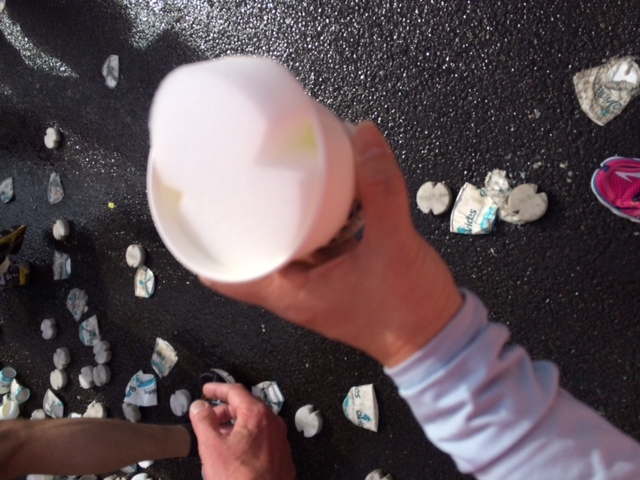 The water cup has a sponge with a small “V” cut, which allowed runner to drink it while running and not spill the water all over. First time seeing it and a very neat idea, but after seeing so many sponges being tossed on streets I wonder where they would end up at? This is a city marathon, and after New York I wouldn’t think any other races can compete in the “grand” category, however Rotterdam Marathon is pretty amazing because of the spectators. Our bibs have our names on it, and I have never had so many people shouted out “Yeh Michele” “Go Michele” in my life! 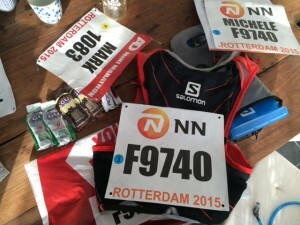 Later I realized that my bib number has “F” in front of it which indicates that I am a foreigner; maybe this explains the cheering in English?!. And the way they pronounced my name was so cute, it sounded like “Michela”. At 20K I looked at the clock and it read 2:21, and I was feeling pretty good except it’s getting a bit too warm for me. I am not a good warm weather runner. More and more people shouted “Go Michela” after 30K, and I could see in distance that people were squinting their eyes and as soon as they could make out of my name they shouted out “Go Michela”, so loud, so enthusiastic, and I high-fived so many little kids. I probably was running through a park or something, because I saw people standing there with trees/forest behind them, it’s so much green though it’s a city/urban race!! It’s probably around 33K or 34K, someone handed out a can of coke to me and asked “cola?” Oh sure, I can take a coke and yes they called it “cola” here. At 35K check point “I Am Walking on Sunshine” was playing loudly and what a coincidence, right?? Friends said I brought sunshine to Europe with me and I would love to take that credit!! At one of the aid-stations they were giving out AA gel and I gave it a try but sorry that I had to spit it out. At 40K I took the GU Roctane that I have been saving for extra boost, and started picking up my pace. I felt a bit tired and feet hurt a little, but overall I was still feeling good. As soon as I came around to that big street (sorry, still can’t pronounce the name), I could hear shouting of “USA! USA! USA” OMG!! You won’t believe how motivational that was when the street was lined with people on both side shouting USA! USA!! I couldn’t help but to run faster and faster, and I felt like Michael Phelps. I have been running races for years and this is the first time I feel like a real athlete! I sprinted so fast toward all the lovely Dutch people while crowds went on and on “Last Kilo Michela” and “Go Michela!” I crossed the finish line and the clock read 4:56. 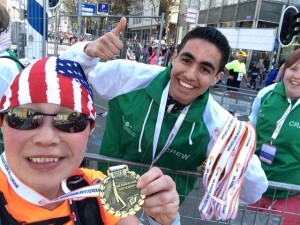 I moved along with the crowds and trying to find my medal 🙂 There was no space blanket or goodie bag waiting like American races, but I DO want my medal 🙂 Near the exit I saw volunteers handing out medals and one of the young teenagers smiled and waved at me, what a beautiful smile he got!! I walked over and he put the medal on my neck for me. So happy and what a Kodak moment! Mark had been waiting for more than an hour, and I was so focused on finishing strong that I didn’t hear his calling out my name. He PRed, in his sandals!! Woohoo!! We retrieved my drop-bag and walked to the train station with our beautiful blings on our neck. Oh so American!!! During the train ride people smiled at our medals and how I limped a little. Two proud warriors return back to Utrecht after victory!! Before we headed out to our celebration dinner Mark found my official result — 4:44:49!! Woohoo!!! I beat the goal I set for myself this morning by 11 seconds!! Amazing race, amazing result!! Great story Michele…about 30 of us from Ireland are running Rotherham this year. Found your account very helpful, some of us worried about the cut off point. Run fast, finish strong, and most importantly — Have Fun!! !